A shipment of shale gas is about to head out from a facility on the Texas-Louisiana border. 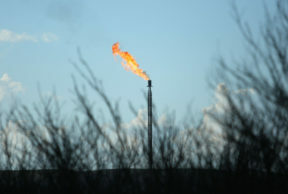 But along with this historic moment comes the danger of fueling the global gas glut. A natural gas well in Denton. Liquified natural gas has never been exported from the lower 48 – until now. A tanker has docked at Cheniere Energy’s Sabine Pass terminal between Texas and Louisiana, ready to be loaded with shale gas. The ship’s been anchored off the coast since January, so its arrival in the Sabine Pass carries the kind of drama that causes TV networks to cutaway to show pictures of the tanker. And there’s another in its wake. Naureen Malik, writer for Bloomberg News, says the export is the first of its kind from the United States. The key there is “lower 48.” Back in 1969, Alaska had an agreement to send natural gas to Japan, but it was a “specialized deal,” Malik says. But since the oil boom and resulting glut, the United States has so much gas that it’s time to export it. But with that comes the danger of fueling the glut. The exports are basically just adding to the global oversupply, so there are certainly disadvantages that come along with the advantage of shipping the gas away. But by now, so much money has been put into natural gas production and exporting facilities. So options are limited. Is this any way to run an industry?